Since none of my questions have fit the forum criteria. I request that you present your case for Jesus, and you put me on trial for a change. There's no reason for anyone to troll a Christian forum demanding Christians engage in proving their faith when there's so many good books to explore. The above authors were non believers and their books are results of their coming to faith. Many atheists came to faith that way. They explored the truth claims of Christianity and came away believers. This is a very large topic. As a starter, would you like me to present evidence for these aspects of Jesus' ministry life on earth, his death, burial, resurrection and continuing work (through the Holy Spirit) now that He has ascended? Why did Jesus' need to die a bloody death by crucifixion? On which topic would you like me to start? He needs to listen to some Chuck Missler videos on YouTube . Chuck really lays it down good. How do you think everything got created? It's 2 months since you made this post and I have not seen your replies to any of the posters who have responded to you. Are you an intentional spamming lurker? If you didn't accept the lengthy testimony (NT) what more can we add that would convince you?? You should note its the "good news" of the gospels not bad news. The Questions for Christians forum is not a debate forum. This forum is reserved for seekers (non-Christians) to ask questions and for Christians to reply with respect and kindness. If tears4fears is not much of a reader (not everyone is) they may be interested in a movie? I've just got my own copy of this on DVD! It was reminding me of Josh McDowell. I might have the name wrong, I read it many years ago. He was a journalist who set out to disprove Christianity and ended up being a believer. He wrote a book, Evidence That Demands A Verdict. A movie I liked a lot along the same theme is Risen, with Joseph Fiennes. It takes place right after Jesus' resurrection, or shortly after. Who Moved the Stone and Mere Christianity. Frank Morris and C.S. Lewis, respectively. I plan to see the movie you posted but I'll have to wait a little longer for it here where I live. BTW, if the O.P. is reading along, he/she should make an effort to read or see the above mentioned. I don't really know about Jesus but when reasoning of pretty much all things in the world is exhausted and you've reached a point where you can't explain something with reason you usually find God there... I do anyway. so wouldn't be a bit illogical and unscientific of you not to hear him out? 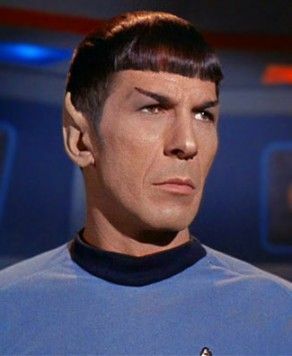 Hey Spock will you listen? tears4fears has not returned since the OP on 28 Sept 2017.